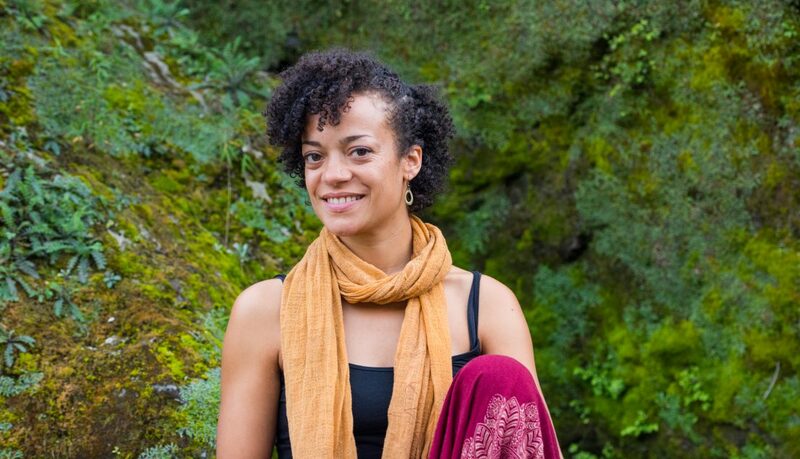 Calia Marshall is a yoga instructor (E-RYT 200, RYT 500), doula, kirtan leader, musician, dancer, choreographer, Reiki practitioner and educator. She has been teaching movement and healing practices to children and adults for 18 years. Calia received her 200 hour yoga teaching certification from Laughing Lotus Yoga Center in 2002 and her 300 hour advanced certification through Ritam Healing Arts with Saul David Raye in 2015. She has deepened her yoga study through working with Seane Corn, Hala Khouri, Suzanne Sterling, Cathy Calderon, Johnathan FitzGordon, Alison West and Kevin & Erin Maile O’Keefe (Circus Yoga). Her mantra music band, Kirtan Soul Revival, has been traveling around the country leading call and response devotional singing since 2011. Calia has been practicing Reiki since 2006, having studied with Dayna Rittenberg and Anne Mulvaney, and is constantly in awe of the powerful healing energy that is channeled through her to her clients. All of this informs her work as a doula, providing prenatal, postnatal, and labor support. She was trained through Ancient Song Doula Services in 2015. Calia finds constant inspiration from the magic that occurs when communities join together to practice yoga, to dance, to sing, and to play. She is so honored to share her curiosity, fascination, love of movement and music, and magic-making with her students and peers.